of her becoming PM in coming months according to Three Baskets Study Circle. It is because of popular vote for her!! So this aspect really stand out for her and her chances to become next PM of India. reason of not having hung parliament because people think strategically. They have seen the rule of UPA and NDA Governments and they have become disillusioned, because the entire wealth have got to the indudtrialists and the rich,since they came to power with their money. the wealth of the nation was not didtributed equally among all sections of the society, in accordance with the Contitution. Where as in Uttar Pradesh Mayawati Ji distributes the wealth to see that all the sections of the society are benefitted and are happy. 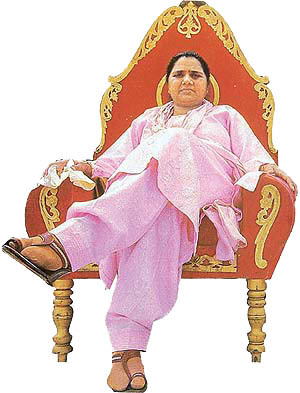 the chances of Mayawati Ji to become next PM is very high. Now one cannot rule out Mayawati JI from getting Prime Minister. But she should become PM on basis of Aboriginal Inhabitant of Jambu Dvipa, that is, the Great Prabuddha Bharath daughter. On the directives of the Uttar Pradesh Chief Minister Ms.
Rs. 75 per day as duty allowance while on duty in the district and Rs. 80 per day outside the district. Minister has conceded their long pending demand. of seeds including oil seeds tenable from February 11, 2009 under VAT Act. improving Urban Transport in the State. Allahabad-150 buses will be put in service. colleges in the State also. allowances would be given like the employees of State Government. Cabinet in principle approves revised pay scale of D.P.R.O. the pay scale of District Panchayati Raj Officers (D.P.R.O.). D.P.R.O. cadre was demanding to revise their pay scales. Singh had left the Samajwadi Party on Friday and joined the BSP. Shanker, Kriti Vardhan Singh and Saif-ur-Rehman Barq. Mukhtar has been named as candidate from Varanasi by BSP and will contest against BJP’s Murli Manohar Joshi. Saif-ur-Rehman had left SP in opposition to Mulayam Singh joining hands with the former BJP leader Kalyan Singh. (ABS) on Friday joined hands with the Bahujan Samaj Party (BSP). Gawli will contest the Mumbai North Central Lok Sabha seat on a BSP ticket. “The ABS chief has already given a letter of consent to merge the two parties,” BSP state president Vilas Garud said. Kanpur in the coming Lok Sabha elections. made keeping in mind dominance of Brahmin votes in the constituency. segment in Sant Ravidas Nagar in Uttar Pradesh this morning. Congress and Bharatiya Janata Party (BJP). three polling booths have been identified as sensitive. The by-poll has been necessitated following the death of a BSP MLA. Counting of votes will take place March 1. Tight security arrangements have been made to avoid any kind of untoward incident. Inter-district borders of the segment with Allahabad, Mirzapur, Varanasi and Jaunpur has already been sealed. Voting is also underway in West Bengal for Bishnupur (West) assembly by-election.